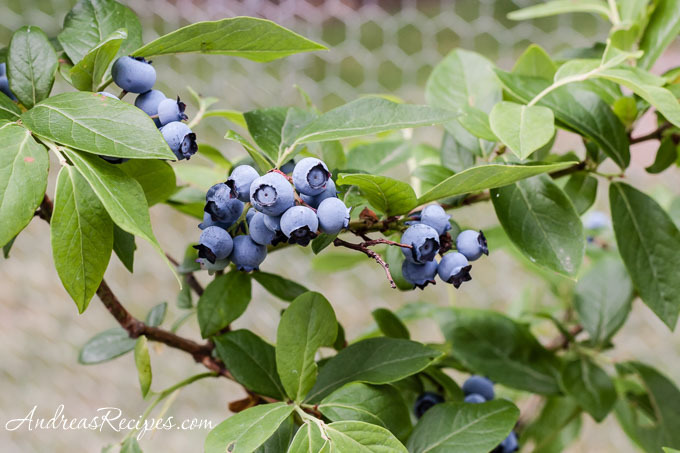 Last year was the first for our blueberry bushes to produce, and we were thrilled when the first bush blossomed and even more so when the blueberries started to ripen. Apparently the birds were just as excited, and they got more of our blueberries than we did; not the desired outcome for our garden. We tried draping a net over the bushes and holding the bottom edges down with rocks, but somehow the birds figured out that maze and got inside. We ended up with just two handfuls of blueberries and decided that we needed to come up with a better blueberry cage. As soon as the blueberries blossomed this year, Michael set out to animal-proof our blueberries with a cage design he created. We can’t say it’s pretty to look at, but it’s very effective at keeping the wildlife out of our precious berries, and we can easily take it down after the blueberries are done this summer. 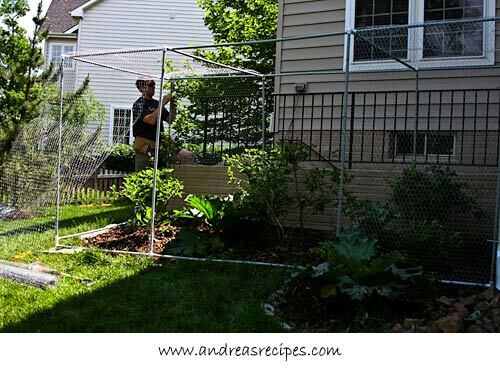 He used pvc pipe and chicken wire, overlapping the chicken wire and securing it to the pipe with zip fasteners. The two back pipes are secured to the rail behind it to keep the cage steady. He also curved the bottom edge of the chicken wire and placed rocks on top to hold them down. In the middle of the cage is a point of entry. The chicken wire overlaps in that section and Michael wove pieces of 9-gauge wire through it and drove it into the ground. To enter the cage, we just slide out the two pieces of holding wire and lift back the chicken wire. Michael’s cage did a great job of protecting our plants, and we harvested our first pound of fresh blueberries this weekend. The boys were delighted and dove right in, and the birds just sat on top of the cage, staring at the sweet berries below. I have a feeling they are plotting against us. wow, so great to have your own blueberries! How I wish I could get some fresh blueberries here. So how easy will it be to take down? Or will you even need to? It won’t be too hard to take down as there’s no permanent installation. We just cut the zip fasteners, roll up the chicken wire, and twist apart the pvc, and we’ll store it all in the shed. My mother recently saw a garden in South Carolina where the owner built a permanent wooden structure, a garden room per say, that does the same thing as this cage, only his was designed for looks as well as function. Though building something permanent is very tempting, we have several blueberry bushes that will eventually grow pretty tall, so it doesn’t make sense to. Yeah, it can be pretty disappointing. That happened with my first cherry harvest. The birds were watching for the best time and left me nohing but stems and seeds! Kind of comical, if I hadn’t been so frustated. The next year, I used netting. But, I love your idea. I’m a PVC freak and this it’s perfect for almost everything. Come visit when you can. That happened with our cherries this year, too, as well as our peaches. Apparently the local wildlife enjoys our backyard buffet. My mom had a blackberry cage– with wood and heavy duty chicken wire. Unfortunately, with the heavy snow fall last year, it came down. They’ll be rebuilding it though, as it not only keeps out the birds, but also the dogs. For some reason, they are ridiculously fond of berries! We used to have a dog that ate our ripe tomatoes, so I can see how they would go for the berries, too. 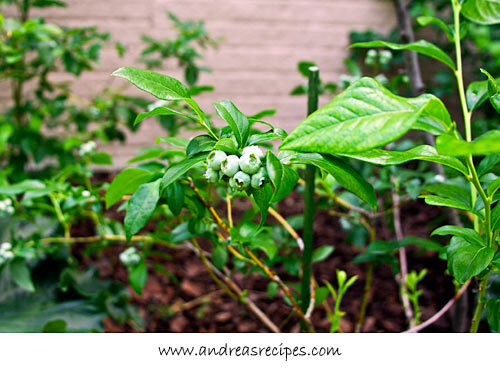 I love that you are growing blueberries. I look at the bushes, very often, when I stopped by the gardening store; but, have yet to try growing. I would love to have a year round supply out our backdoor! I dream of a year round supply of blueberries, but out here we only get them in the summer months. You should plant some! This makes me appreciate the loads of berries we are able to lay our hands on at local pyo farms. Most of them seem to be using recordings of hawk calls to keep the birds away or some other loud noise. Probably not a good idea in suburbia though. Congrats on your first real berry harvest. I dream of being able to do that someday. They look divine.